“Here come the champions” is a common expression that will be used as the No. 5 Clarkson Golden Knights (20-5-1, third in ECAC hockey) roll into Hamden, Connecticut to face off against the Quinnipiac Bobcats (9-14-3, seventh in ECAC hockey). The reigning national champions, Clarkson, have won eight of their last 10 games. One last two losses were against Cornell, who sits above Clarkson in ECAC hockey by a single point but below them in the latest USCHO poll. The other loss was against Northeastern in a game that took place in Ireland, and is ranked third in the USCHO poll. Quinnipiac last played ECAC hockey opponents in early January, losing to nationally ranked opponents Cornell and Colgate. The women’s team then went on a road trip to Minnesota-Duluth. The team managed to split the weakened series losing 3-1 and bouncing back the second game to win 2-1. The senior forward leads the Bobcats in assists with 10. Lancaster, who usually plays on the right side of the first forward line, brings experience, an excellent playmaking ability and vision to the team. She is continuing her role as the lead playmaker on the team, as she led the Bobcats in assists as a junior. Loren Gabel has become a clear candidate for not only ECAC hockey player of the year, but potentially NCAA player of the year. The senior forward leads the nation in scoring with 49 total points. She also leads her team in goals (25), shots (179) and game-winning goals with six. She was recently named the first star of the week by the NCAA, and also scored her 100-career goal in Clarkson’s 4-2 victory over Harvard. She currently ranks first in the nation in goals per game (1.04) and second in points per game (2.04). It is finally time, time for the return of T.T. Taylar “T.T.” Cianfarano is making her big return to her former university. 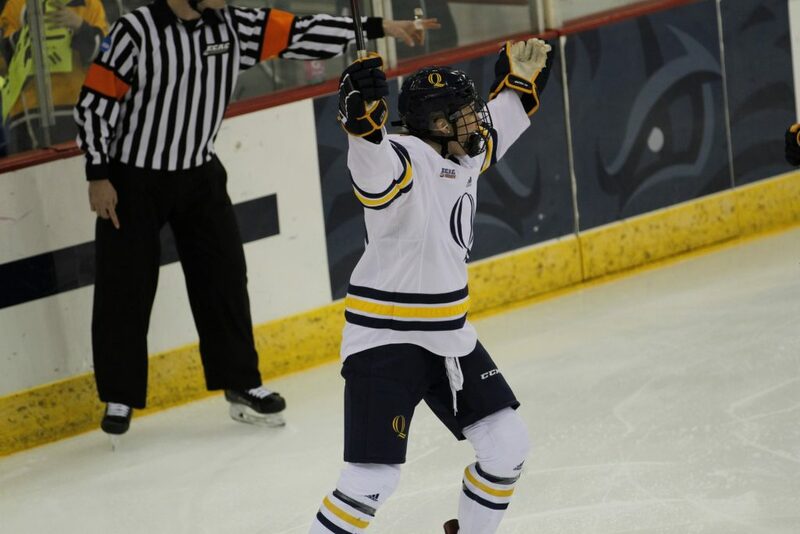 Cianfarano first appeared as a freshman at Quinnipiac during the 2014-15 season, where she made the ECAC hockey All-Rookie team. The as a sophomore the next year, she exploded for 28 goals and 24 assists, and earning ECAC hockey player of the year. She had one of the best seasons ever as a player in program history, becoming only the third player in program history to record a 50-point season. Cianfarano went on to have a good junior season, but was injured early in her senior season, and sat out all but two games. Cianfarano, now a graduate student, is with Clarkson and is looking like her former self, as she has put up 28 points through 26 games, and she is doing behind three players who all have 40 plus points. Quinnipiac will also have to watch out for her on the power play, as she is tied for first on the team with four goals this season. We will have to see about the reception she gets as she plays at her old stomping grounds. Clarkson is second in the nation in total goals. So, whatever they have been doing, is working. They have five players who have at least 20 points this season, while Quinnipiac only have four players who have 10 or more. The goals are going to come in this game, and even on away ice, they are still going to score. That last time Clarkson did not score at least one goal in a game was over a year ago in Princeton. While Abbie Ives has had pretty good year in the Bobcat’s net, posting a 1.82 goal-against average and a .928 save percentage, she gets caught out of position early. An early goal for either team would change the entire mood on the ice and in the rink. Listen, this Clarkson team is absolutely tremendous. They can score from almost anywhere on the ice. They have some very skilled players up front and on their blue line. Well, the best way to play against a skillful group is to get up in their face. Playing fast, physical hockey will allow for the Clarkson skaters to have less time to create something. Play tough and even on the edge my help out this scrappy Quinnipiac team. If you end up taking a penalty, that is not a big deal, as you just beat a Minnesota-Duluth who is top ten in power-play goals. Clarkson also is not the most disciplined, taking, on average, over four penalties a game, and has over 200 penalty minutes this season. Keeping the players fresh and quick line changes will allow for less mistakes defensively and keep pressure on the reigning champs. Looking at the ECAC hockey conference, it is growing and getting more competitive each and every year. Quinnipiac just beat Minnesota-Duluth, who have won five titles since 2001. Clarkson has won three titles since 2014 and has made six straight NCAA playoff appearances. Looking at the top ten in the USCHO poll, Princeton, Clarkson, Cornell, and Colgate are all ranked. The ECAC hockey conference is no longer a small-time conference. In women’s hockey, it is now a powerhouse. I am not saying it is going to overtake the WCHA, which has the powerhouse Minnesota, but the ECAC is one of the most completive conferences out there. One final stat for you all; guess where Clarkson won its first NCAA title? Right here in Hamden, Connecticut, and an ECAC hockey team might have the chance to do it again this year as the women’s Frozen Four is being hosted in Hamden. The Golden Knights and the Bobcats take to the ice this Friday, February 1 in Hamden. The puck drops in the Frank Perrotti Jr. Arena at 6 p.m. Tom Krosnowski and Connor Ullathorne will be on the call. Listen into the game on mixlr.com/qbsn, or follow along with updates on twitter @QBSN, @cully5, and @Tkro42.